Her in the soft light of the room. “Who’s to say they can date the beginning? Discovering what we don’t know. The soul. Faith is the only answer here. This?” Rana asked with a casual blink. “Not quite.” She said pausing to stand still. “All worlds have this measure. All of them. Has existed…if not all Universes. Like The Lion Men, and they with us. “Yes.” She simply smiled and nodded. “He is aware of the transmission, yes. But not by whom. Why?” Ceres asked. In fact, land to replace lost fuel? Eyes trying to contain her disgust. “The Postulate is blocking transmissions? Should falter? Not notice something? Rana simply laughed, end transmission. Traditional way, of course, no hints there. To create something New…But why? 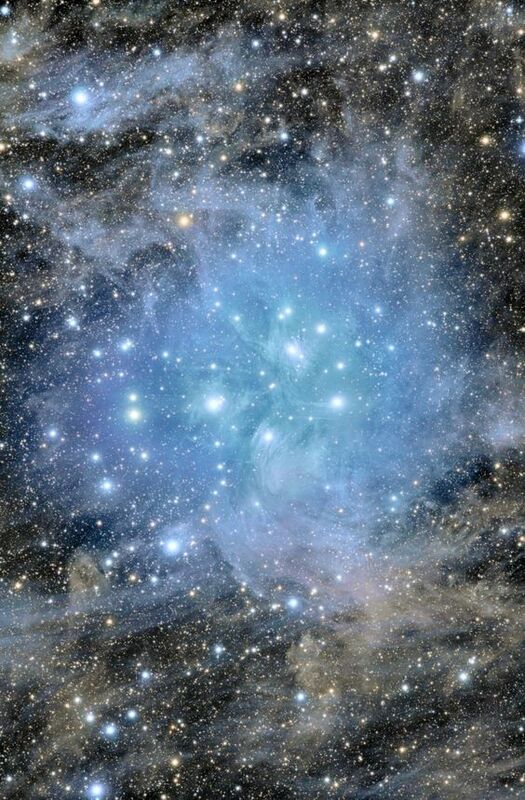 And hovered, concealed to all, but Ceres. Freed slaves’ ships of the Adams and Eves. Of The Last Lion on Earth, but hid this. Rest of the World…The Native Americans. “What do we do?” The boy asked. Then…A woman entered beside him. Anxious…it had not expected this! Companion…she did love black cats. He nodded for Rana to speak. Hey Troy, love the spirit dj’s synchronicity for you! I didn’t know it was Def Leppard “Photograph” until I saw your post. It’s funny because yesterday I read the new post while I was at work, but when I got home I realized I didn’t know what the song was that went with it, and I totally spaced it looking it up until you wrote that. Strangely enough, I had just found some notes I jotted down around 2 months ago, back when they were encouraging us to share our “miracle” stories (which I’m awful for not doing it, I wanted to, I just have been unable to really get out of my shell much again)….and one of them was another post Bill shared a Def Leppard song and I wrote down that it played as the last song I heard getting out of my car that same night at Tractor Supply, on way grocery shopping. That’s what my spirit dj’s do for me, but usually it’s a Peter Gabriel or Genesis song, first song I hear turning on my radio or last song upon getting to my destination. I guess that’s probably a “sign” I should go ahead and share my “miracles”….my angel encounters happened for many years but I’d like to share some of the more poignant ones. Oh yeah, I found it! I wrote this in the parking lot of Tractor Supply on August 3rd this year. Funnily enough, it was *Photograph* by Def Leppard then too! These were some of the other “miracles”. I may not write out the whole story right now, not sure if I have enough time before my husband gets home and will want supper. Plus I think I’ve shared some of this before, but I’ll try to cover these briefly. If STC will let me post, that is. This morning I tried to write something for the first time in weeks, and it showed me as logged in as spiritwalker444, but I got a strange error message that oops, I’m not allowed to post? Actually I think for now I’m going to share just this…just to make sure I can post first before I type all the stuff I have in mind to share. This was my short post I wanted to post this morning…. Bill, you have such an amazing gift. Thank you for sharing with us. It is all, always, very precious to me to receive the knowledge you impart to us. You also have a beautiful way with words. Thank you so much for all that you offer to us, and for the giving to us the very enlightening wisdom of…The Watchers. I can’t do it. I wrote a lot last night, I intended to share it. Please forgive me. I’m not there yet. The really good stuff that’s happened just seems to also bring out the memories of the really bad stuff, at the same time. I’m trying to just find my peaceful center and try to stay there. By not going to one extreme end, that helps keep me from reliving the other experiences, at the other extreme end. Bill’s posts, with life-changinginformation from the Watchers, are truly helpful. They help me understand what kind of forces are at work in this world, and in other worlds. Hopefully teaching me how to live a higher life thanks, to refocus upon the perspective of the higher/lighter/good forces, who are so very aware of the works and the methods of the darker/evil forces. In a world like ours it is so very much an inner battle, as well as outer. We need help, to be able to see enough and more clearly, to turn on the light switch, to allow the good and the light to prevail. CANADA…ON MY MIND… 😉 WHY??? Wow, thank you for having reminded of the “photograph!! !” I didn’t realize until seeing your comments on this subject that I should have happened to have many photos shared by friends in their trips, respectively from north-west & north-east, one from the desserts, whereas the other from islands. Despite of my silence, I’ve never ceased thinking to share something here, particularly it appeared as the lady seems prompting public outcry, thanks to the latest episode of Grey’s Anatomy which gave me the very phrase when I was looking up. Then just like Barb, I’ve been trapped in some old case/stuff, and I’m totally weary even frustrated, and panic for this drama which could be prevented. Now, I even cannot know if I can retrieve what I was thinking to share. The cosmological energy feels so strong that drives the emotions fluctuates just like the giant ocean waves induced by storms, ether at peace one time, then soon fell into the furious state the next minutes. I need much more sleep than before. And now the weather soon turns cold, feeling rather WINTER, all my bodies get inevitably frozen, even backwards. Here came as well lots of times or sessions when the energy pouring into the crown chakra, which literally affects my linguistic system that even speaking in mother tongue feels so difficult. 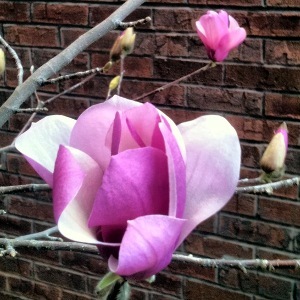 Dear Barb, thank you so much for this thoughtfulness of sharing for uplifting all. In regards to the missing words, how much I can understand those circumstances, as it happened so many times to me, too. A more secure way is that we write somewhere else in word or txt application first, then attach that text to this comment panel. Nevertheless, I myself still prefer to type directly here, as it feels really so different from the energy field on any other app. Yes, this site, thanks to all of you, the energy just feels so different. I’s the very WARM & ATTRACTIVE GARDEN that I cannot help being attached to so much. doesn’t this God depicted here happened to remind of…..? Dear Robin, so great to have your powerful sharing again. Why Canada? You know our super weighted Dreamwalker (Troy) is just Canadian, besides, there are still some pioneers or predecessors who came much earlier and had lots of fervent dedication for/in this garden, such as John, Babaji (who has both Caucasian and American Indian heritage). All these three gentilemen’s gravatars are on our group table. There might be more predecessors that I didn’t know. Anyhow, I would like to take this advantage to address my highest homage to you all !!! Why Canada? A synchronicity here I meet, the NORTH that the pictures on Thor; Hapi, the baboon-headed god representing the north ; Ring of Brodgar, Orkney, Scotland, UK ; Celtic /Viking hilt…. 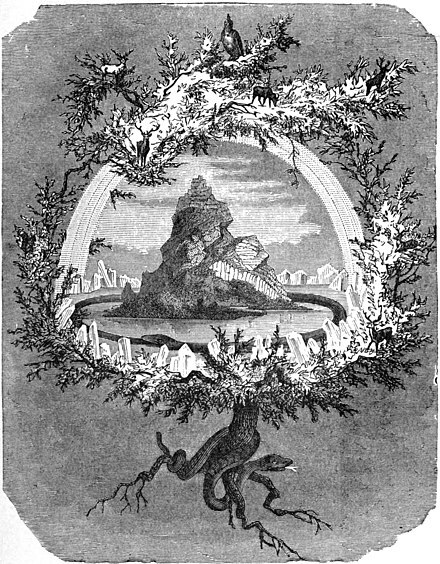 Yggdrasil (/ˈɪɡdrəsɪl/ or /ˈɪɡdrəzɪl/; from Old Norse Yggdrasill, pronounced [ˈyɡːˌdrasilː]) is an immense mythical tree that connects the nine worlds in Norse cosmology. Yggdrasil is attested in the Poetic Edda, compiled in the 13th century from earlier traditional sources, and the Prose Edda, written in the 13th century by Snorri Sturluson. In both sources, Yggdrasil is an immense ash tree that is center to the cosmos and considered very holy. The gods go to Yggdrasil daily to assemble at their things. The branches of Yggdrasil extend far into the heavens, and the tree is supported by three roots that extend far away into other locations; one to the well Urðarbrunnr in the heavens, one to the spring Hvergelmir, and another to the well Mímisbrunnr. 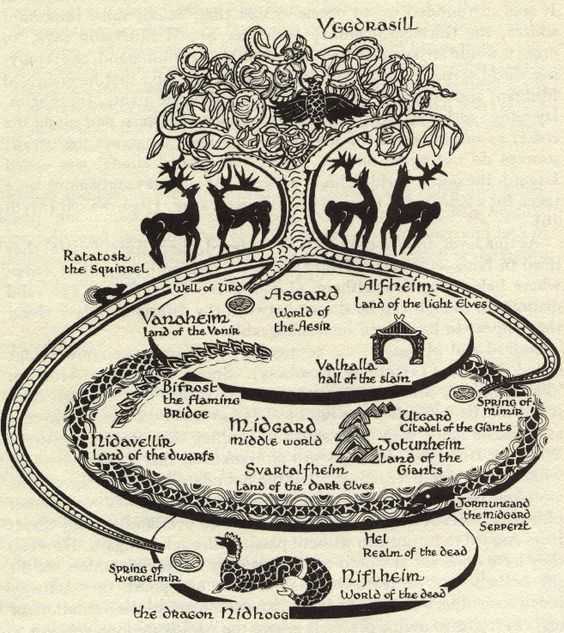 Creatures live within Yggdrasil, including the DRAGON Níðhöggr, an unnamed EAGLE, and the STAGS Dáinn, Dvalinn, Duneyrr and Duraþrór. Conflicting scholarly theories have been proposed about the etymology of the name Yggdrasill, the possibility that the TREE is of another species than ash, its connection to the many sacred trees and groves in Germanic paganism and mythology, and the fate of Yggdrasil during the events of Ragnarök. The generally accepted meaning of Old Norse Yggdrasill is “Odin’s horse”, meaning “gallows”. This interpretation comes about because drasill means “horse” and Ygg(r) is one of Odin’s many names. The Poetic Edda poem Hávamál describes how Odin sacrificed himself by hanging from a tree, making this tree Odin’s gallows. This tree may have been Yggdrasil. Gallows can be called “the horse of the hanged” and therefore Odin’s gallows may have developed into the expression “Odin’s horse”, which then became the name of the tree. Nevertheless, scholarly opinions regarding the precise meaning of the name Yggdrasill vary, particularly on the issue of whether Yggdrasill is the name of the tree itself or if only the full term askr Yggdrasil (where Old Norse askr means “ash tree”) refers specifically to the tree. 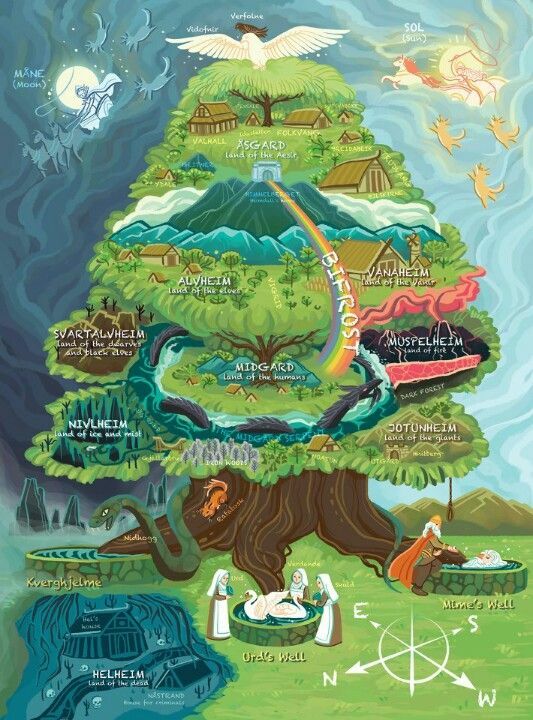 According to this interpretation, askr Yggdrasils would mean the world tree upon which “the horse [Odin’s horse] of the highest god [Odin] is bound”. Both of these etymologies rely on a presumed but unattested *Yggsdrasill. A third interpretation, presented by F. Detter, is that the name Yggdrasill refers to the word yggr (“terror”), yet not in reference to the Odinic name, and so Yggdrasill would then mean “tree of terror, gallows”. F. R. Schröder has proposed a fourth etymology according to which yggdrasill means “yew pillar”, deriving yggia from *igwja (meaning “yew-tree”), and drasill from *dher- (meaning “support”). In Norse mythology, Yggdrasil is an immense tree that is central in Norse cosmology; the world tree, and around the tree existed nine worlds. Incredible description of Yggdrasill, Feilla. I have read that “XII The Hanged Man” of the Tarot, represents Odin hanging form the World Tree…”Odin’s Gallows”…interesting. I really don’t know why CANADA is on my mind…but I did have a dream about a year ago of visiting a little country craft store in Montreal (?) ,The other day I had the most incredible premonition of living there in the near future. It was so vivid, I was living in a nice rustic cabin, a fire going in the fireplace, such a cozy warm atmosphere , I could even smell the cabin! . Where was I? The GASPE PENINSULA perhaps? There is a prophecy about the younger brother of Glous Cap who is called “Young Wolf” being buried on the Gaspe Peninsula. That when the land begins to shake in those there parts…it will signal that Young Wolf has awakened and it will be TIME for Glous Cap to come again and do battle once more with “the Giants of old”. I had no idea you were a Canadian, Dreamwalker! That is so cool! Hmmm…might explain the dream I had of replanting a Japanese Red Maple tree with Bill about two years ago, in the dream there were huge roots going down into a cavern and I was telling Bill that you had to yell down to the roots(?) in order to do something…make a request of the Norn perhaps? The Canadian Flag…it is a White background with a Red Maple Leaf on it…very symbolic… Are we all planting or replanting a garden? Yes indeed, Robin – hey if you’re going to go geek, ya gotta own it!!! I developed an appreciation for the flag as the autumn leaves in the eastern part of north america can be really majestic. It’s a symbol of nature; the red can represent socialism (the well-being of your community) and the white can represent surrender and peace. I see these things not as weaknesses but as strengths. This is not a political position… it’s an instruction manual for the very near future. Culinary tip: Real Maple Syrup + Coffee = yum! Oh yeah, and speaking of Bill… the dream I had about him as Thor.. well here is a scene from that dream! The Norns (Old Norse: norn, plural: nornir) in Norse mythology are female beings who rule the destiny of gods and men. They roughly correspond to other controllers of humans’ destiny, such as the Fates, elsewhere in European mythology. In Snorri Sturluson’s interpretation of the Völuspá, Urðr (Wyrd), Verðandi and Skuld, the three most important of the Norns, come out from a hall standing at the Well of Urðr or Well of Fate. They draw water from the well and take sand that lies around it, which they pour over Yggdrasill so that its branches will not rot. These three Norns are described as powerful maiden giantesses (Jotuns) whose arrival from Jötunheimr ended the golden age of the gods. They may be the same as the maidens of Mögþrasir who are described in Vafþrúðnismál (see below). Beside these three famous Norns, there are many others who appear at a person’s birth in order to determine his or her future. In the pre-Christian Norse societies, Norns were thought to have visited newborn children. There were both malevolent and benevolent Norns: the former caused all the malevolent and tragic events in the world while the latter were kind and protective goddesses. 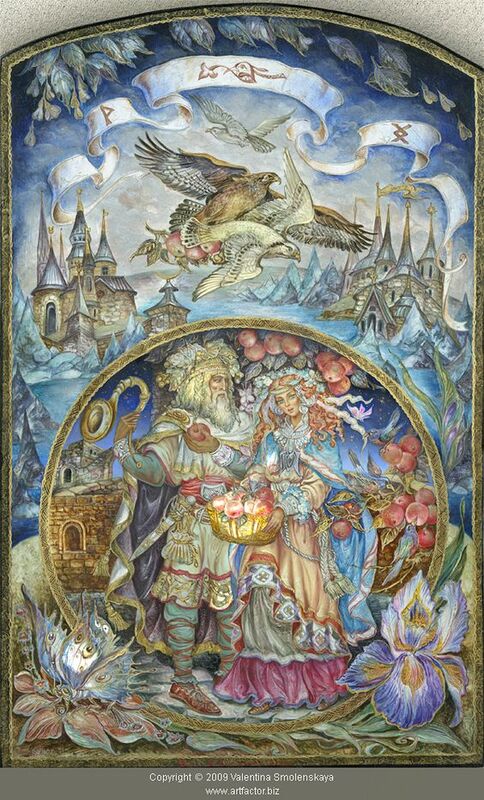 The origin of the name norn is uncertain, it may derive from a word meaning “to twine” and which would refer to their twining the thread of fate. Bek-Pedersen suggests that the word norn has relation to the Swedish dialect word norna (nyrna), a verb that means “secretly communicate”. This relates to the perception of norns as shadowy, background figures who only really ever reveal their fateful secrets to men as their fates come to pass. The name Urðr (Old English Wyrd, Weird) means “fate”. It should be noted that wyrd and urðr are etymological cognates, which does not guarantee that wyrd and urðr share the same semantic quality of “fate” over time. Both Urðr and Verðandi are derived from the Old Norse verb verða, “to be”. 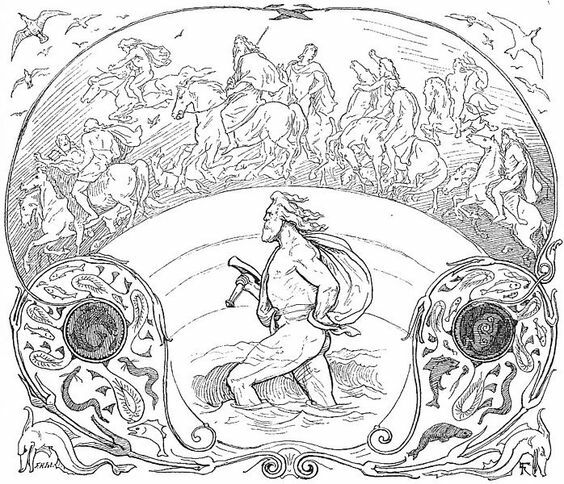 It is commonly asserted that while Urðr derives from the past tense (“that which became or happened”), Verðandi derives from the present tense of verða (“that which is happening”). 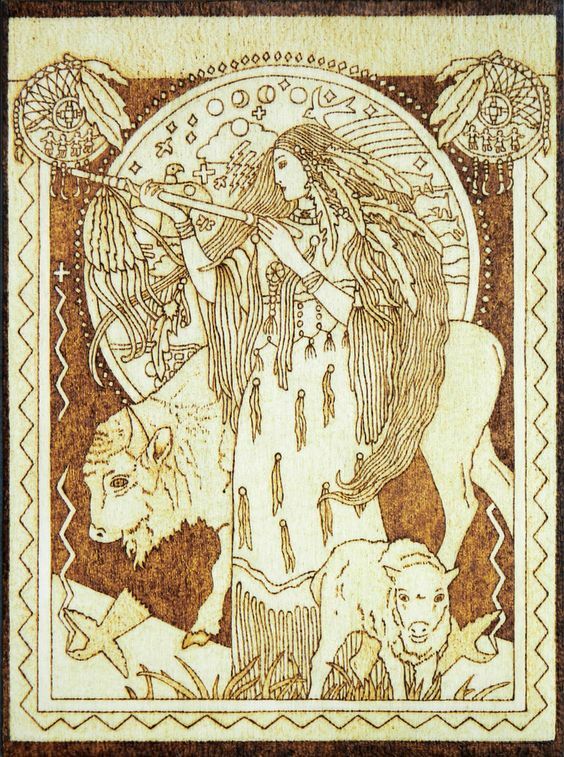 Skuld is derived from the Old Norse verb skulu, “need/ought to be/shall be”; its meaning is “that which should become, or that needs to occur”. Due to this, it has often been inferred that the three norns are in some way connected with the past, present and future respectively, but it has been disputed that their names really imply a temporal distinction and it has been emphasised that the words do not in themselves denote chronological periods in Old Norse. 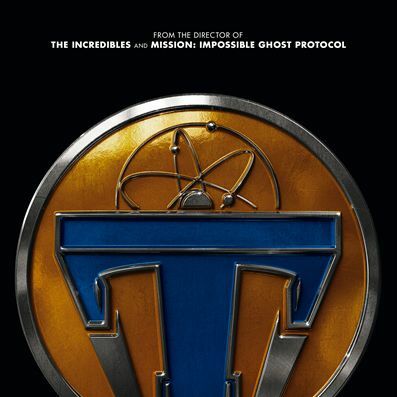 Last week, I seemed to be led to watch the film, Tomorrow Land 2015. As before, after reading the critics, I once thought to abstain from watching it, particularly the internet has been quite blocked for this is the very month. For some non-reasonable reasons, I still watched it, but not til the end, as the version I got was not complete. Honestly, when the movie trailer was released, I was already quite fascinated by. Then in the course of watching it, again and again, I could not be shocked more. There are so many codes on “T,” so many, along with Lisa’s return, all these remind me again, the TLV magic or alchemy!!! This time, wolf, birds, stag, hare, dragon, tree, water, fire, air seem the the marks which are indispensable!!! I’ve in fact been thinking of inviting you to watch this film, for getting the TOUR/TOWER. I had never known this film could have anything to do with that city. Then after or rather since a couple of weeks before having watched it, the dreams in which that I visited it get more and more intensive. With regards to the dream-decoding, I cannot thank Lisa enough for that super awesome video (the last one that I could consult) when the fence gets crazy, which helps so for me to make more sense of my dreams. However, there is still one which looks so profound but I still cannot well interpret. Still that city seems tied with the very grief of the death of someone I know. She or he turned back, however, seemed not physically being. Sorry for that I can only retrieve the last scene of it, as in a church by the docks, this returning friend was coming along with a catholic sister, both standing on the altar which should look like the platform or dais of the classroom. My dear ones, THIS MONTH, may I invite you all, the BROTHERS & SISTERS, to keep sending protecting, HEALING and blessing energy to LISA in South Africa, LESLEE, TAUNO, BARB, ROBIN, all our beloved ones with your MAGICAL LOVE !!! Here, I have to thanks to Valiant, the both senior & junior Lida, the Master and the lovely ELDERS’ guide for that I can stand here to be with you, to speak again. Very interesting that you should mention the recurrence of the T, Feilla. I have been having quite the chat with a friend on the symbolism of T. In the Cabala, Daleth looks very similar to a T and it represents, “Portal”, “Doorway”, and “Death”. This picture looks somehow quite insistent that it’s hard to ignore it, despite of my very ignorance of Viking mythology…. 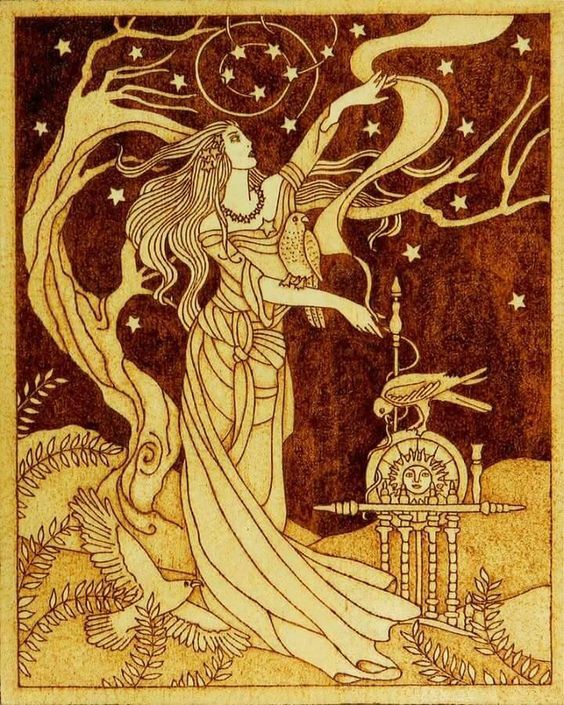 Beautiful pyrography artwork depicting Frigg, Norse goddess of wisdom and foreknowledge, wife of Odin and mother of Baldr with three sacred birds (hawk, falcon and raven), standing tall and proud against the star-filled sky. 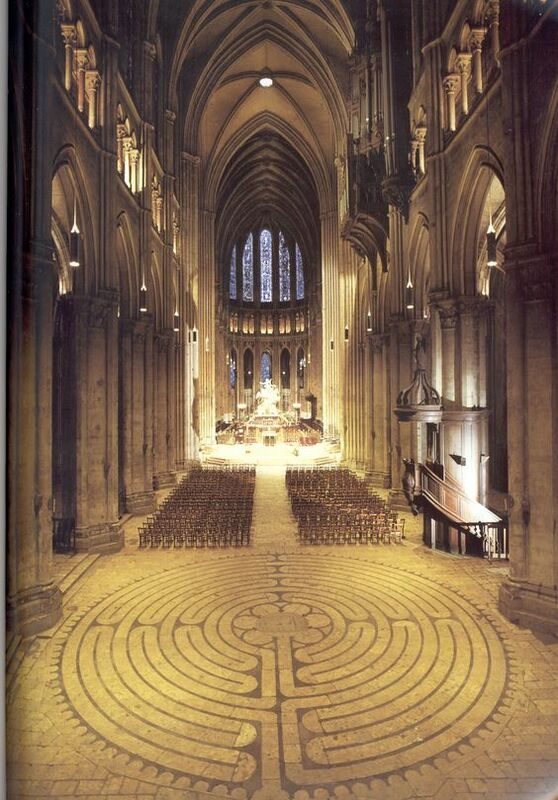 How strange that then the page starts showing the American Indian Goddess…. Something that I had chance to read and have been thinking to share. My these help ward off the evil eyes from you all, my beloved ones…. Glass is a medium not often associated with ‘barbarian’ craftsmen, yet from the Hallstatt period onwards glass becomes an important medium in Celtic art. By the middle and late La Têne period, bracelets in translucent blue, green, yellow and clear glass are known, some with elaborate moldings, fluting or inlaid ornament around their edges (1). In Bulgaria such La Têne glass bracelets have recently been discovered in the Celtic habitation layers at the hillforts of Arkovna (Dalgopol district, Varna region)(2) and Zaravetz (Veliko Tarnovo), dating from the 3rd c. BC onwards (3). Similar glass bracelets have recently been discovered in association with other La Têne material at verious sites across Bulgaria, from Kavarna on the Black Sea coast (4) to Babyak in the Rhodope mountains (5), as well as at the ancient city of Helis (Sboryanovo archaeological reserve, Razgrad region; See below). The belief in the ‘Evil Eye’ is present in many ancient cultures, and literary evidence attests to it in the eastern Mediterranean for millennia starting with Hesiod, Callimachus, Plato, Diodorus Siculus, Theocritus, Plutarch, Heliodorus, Pliny the Elder, and Aulus Gellius. It is also represented in Celtic mythology, notably in the form of the Fomorian giant Balor of the Evil Eye (Dundes (1992). Evil Eye: Folklore Casebook. Madison, Wis. University of Wisconsin Press; Kinahan G.H. (1894) ”Donegal Folk-lore: Ballor of the Evil Eye.” In: The Folk-Lore Journal. Volume 5). 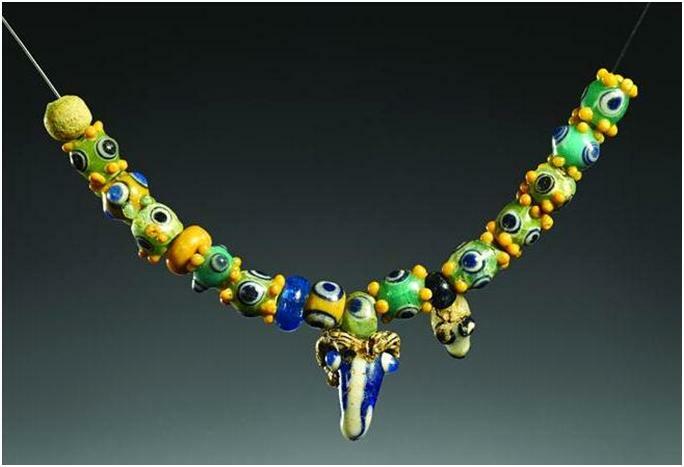 Of interest in the present context are the glass nazars, or ‘magical’ charms, used to ward off the evil eye, particularly popular in the Balkans and todays Turkey, and generally believed to be originally of Turkish origin. Disks or balls, consisting of concentric blue and white circles (usually, from inside to outside, dark blue, light blue, white, dark blue) representing an evil eye are common apotropaic talismans in the Middle East today, found on the prows of Mediterranean boats and elsewhere; in some forms of the folklore, the staring eyes are supposed to bend the malicious gaze back to the sorcerer. Known as nazar (Turkish: nazar boncuğu or nazarlık), this talisman is most frequently seen today in Turkey, Bulgaria and other southeastern European countries, found in or on houses and vehicles or worn as beads. In fact, recent evidence from archaeological sites in Bulgaria suggests that this particular kind of glass ‘evil eye’ charm has its origins not in the east, but in the west. In each case the aforementioned glass La Têne bracelets discovered at archaeological sites in Bulgaria have been found together with glass ‘Eye Beads’, which in turn have direct parallels from earlier Celtic sites across Europe. It should also be borne in mind that the Celts who settled in the Balkans during this period also established the Celtic state of Galatia in present day Turkey from 277 BC onwards. Glass ‘Eye’ bead bracelet from a Celtic burial at Necropole de Prosnes (Marne) France. 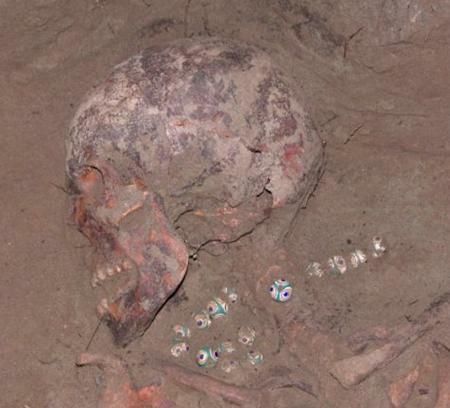 Particularly interesting is a necklace of identical glass eye beads executed in the same ‘millefiori technique’ discovered recently in a ‘princess’ burial in the Altai mountains region of Russia. This so-called ‘Cleopatra Necklace’, a unique find this far east, most probably reached the Altai region through trade with the Celto-Scythian Bastarnae tribes in eastern Europe, and is particularly valuable for our understanding of trade and the spread of technology between Europe and Asia in the late Iron Age. The Altai ‘Princess Necklace’ which, according to Russian archaeologists, belonged to a 25 year old ‘Virgin Priestess’. Common Celtic patterns employed in the creation of glass artifacts are for the most part very simple and geometric. One of the most common patterns are those consisting of concentric circles. THESE RESEMBLE EYES AND MAY HAVE BEEN USED AS PROTECTION AGAINST MISFORTUNE; as in the ‘evil eye.’ Triskels, s-scrolls, running-dog patterns, and chevrons (all indicators of the La Têne style) are also quite commonly found among Celtic glass artifacts of this period. Claims by Bulgarian archaeologists (6) that these eye beads first ‘appear’ in Thrace in the 2/1 century BC are logically contradicted by their discovery at Celtic sites across Europe from the 5th c. BC, and at Celtic sites in Bulgaria, such as Arkovna and Zaravetz, from the beginning of the 3rd c. BC onwards. It would appear that these eye beads had religious significance for the Celts, as they are often found as votive offerings. This is confirmed by their discovery at cult sanctuaries such as that at Babyak in the Rhodope mountains. 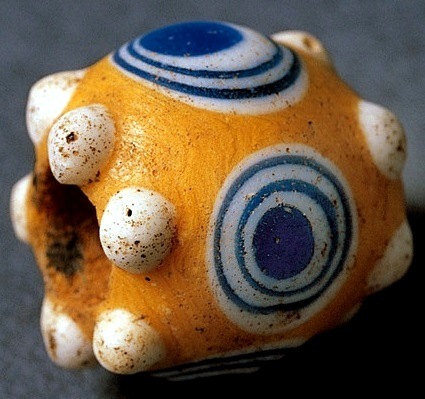 Evidence from such sites also suggests that these ‘evil eye’ beads were primarily worn by women, as they are generally found in parts of the complexes together with typically female articles such as female torcs, bracelets and ‘cult’ firepots. It has long been noted that the cult of the head ‘constitutes a persistent theme throughout all aspects of Celtic life spiritual and temporal, and the symbol of the severed head may be regarded as the most typical and universal of their religious attitudes’ (Ross A. Pagan Celtic Britain. London 1967:163). Strabo informs us that ‘when they depart from the battle they hang the heads of their enemies from the necks of their horses, and when they have brought them home, nail the spectacle to the entrance of their houses…’ (Strabo IV, 4,5). Amongst the Celts the human head ‘was venerated above all else, since the head was to the Celt the soul, centre of the emotions, as well as of life itself, a symbol of divinity and of the powers of the other-world’ (Jacobstahl P. Early Celtic Art. Oxford. 1944; see also Mac Congail 2010: 173-175). The severed head is also one of the main core symbols on Celtic artifacts and coins from the Balkans in the 3rd – 1st c. BC. In this context, perhaps the most interesting glasswork produced by the Celts, apparently from Phoenician prototypes, were the ‘Face/Head Beads’. These have been found at a number of Celtic burials and other sites from central (Germany, Switzerland etc.) and eastern Europe (Czech Republic, Hungary, Romania, Bulgaria etc.) (7). A wonderful example of this type of face bead from Bulgaria comes from the Mogilanska Tumulus (Vratza region)(fig. 4), which has direct parallels in examples discovered at Celtic sites in the Czech Republic and Romania (8). Similar artifacts have been unearthed in recent years during excavations at other sites in Bulgaria such as Appolonia Pontica/Sozopol (9), Mavrova Tumulus (Starosel, Plovdiv region)(10), Burgas(11), Kavarna (Dobruja region)(12), etc. 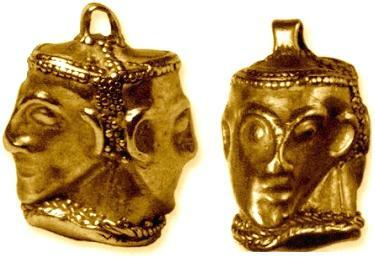 Also interesting, from an artistic perspective, is a gold ‘Janus head’ pendant (fig. 6) executed in a repossé technique and decorated filigreé and granulation, discovered in the Shumen region of northeastern Bulgaria, and dated to the same period. From a morphological and stylistic perspective the closest analogies are the Celtic ‘bead heads’ found among the Celts of central and eastern Europe, examples of which come from sites such as Mangalia, Piscolt and Vác (Rustoiu 2008), as well as from sites in Bulgaria such as the aforementioned Appolonia Pontica (Sozopol), Mogilanska Tumulus (Vratza region), Mavrova Tumulus (Starosel, Plovdiv region), Burgas, Kavarna (Dobruja region), etc. 1. Harding D.W. 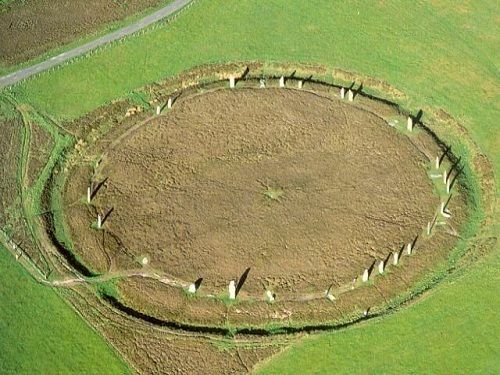 The Archaeology of Celtic Art. London/New York. 2007. P. 7-8. 2. Lazarov 2010:105 and figs. 5/4 – 5/6; see also New Celtic Material from Bulgaria articles 1 + 2. 3. Kvinto 1985 = Квинто Л., Келтски материали от III– I в. пр. н.е. в тракийското селище на Царeвец – ВТУ, XI пролетен колоквиум, юбилеен сборник на възпитаници от ИФ, т. II, 1985. 5. See ‘Killing the Objects’ article. 6. Tonkova, Gotzev 2008. See ‘Killing the Objects’ article with relevant cites. 7. Harding op cit; See also Megaw V, Megaw R. Celtic Art : From Its Beginnings to the Book of Kells. London 1989. 8. V. Megaw, personal communication. I would like to express my gratitude to Prof. Megaw for his expert opinion on this issue. 9. Konova L. = Конова Л. 2005. Магия и погребален обред. Глинени култови фигури от некропола на Аполония Понтика – In: HEROS HEPHAISTOS. Studia in Liubae Ognenova-Marinova, Veliko Tarnovo, 148-164. Wow……..too awesome all these sharing and perspectives, thank you so so so much !! !, That Hebrew letter, that site in Quebec, Hammer….etc. You are just reminding of something that I had thought to share, but not done yet. They are the caves which occurred to me, among them the 1st one is a Slovak one but with Hebrew ? interpretation, the 2nd one is Mammoth Cave, the 3rd one in Bulgaria, the 4th one….I can no longer recall. Last mid-night before sleeping, the energy field got so strange that there seemed to exist some very intensive electricity in the air, so intensive that even visible. So hard to fall asleep, then some very loud metal crack just sounded in my head. I woke up early after short sleep, and then the headaches never stopped. Sorry that I still have some linguistic problem, as the pressure is not gone yet. Honestly, I cannot tell if this is malevolent interference or not. I’ve to take this chance to share this in time, brought by the Masters who realize my situation via physic knowing !!! Though I had watched it several years ago, strange that this time when watching it again, it feels so new. I know it’s worth for me watching it quite meticulously, and more than just one time. Then a picture came up in the same thread of Thor?!!! Have an amazing THURSDAY, my tribe. By the way, how could we miss sending our protective, HEALING and blessing energy to the most weighted ladies here in tribe, our senior and junior LIDA !!! THANK YOU, MY LOVELY TRIBE !!! LET’S MAKE THIS OCTOBER MIRACULOUS & JOYFUL !!! Dreamwalker really knows how to bring this MAGIC !! !